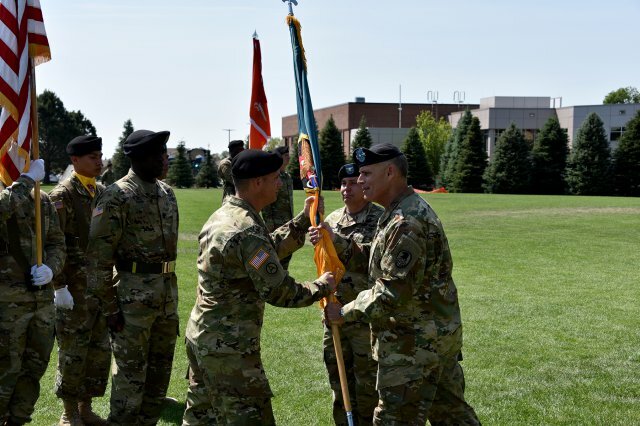 June 24, 2016 – Col. Richard L. Zellmann assumed command of the 1st Space Brigade from the outgoing commander, Col. Thomas L. James, during a Change of Command conducted at Peterson Air Force Base, Colorado on June 21. Lt. Gen. David L. Mann, commanding general, U.S. Army Space and Missile Defense Command/Army Forces Strategic Command, hosted the ceremony for the 1st Space Brigade, which provides critical space capabilities and products to Warfighters and combatant commanders. Mann then turned his attention to the incoming commander. As the outgoing commander, James honored the Soldiers, civilians and contractors of the 1st Space Brigade. James told attendees how fortunate the brigade was to have Team Zellmann at the helm. Upon taking command, Zellmann addressed the importance of the brigade. Prior to the official ceremony, Mann presented the Legion of Merit Award to James for exceptionally meritorious service as commander of the 1st Space Brigade and the Outstanding Civilian Service Medal to Nicole for her support to the community and for her contributions and efforts to the Soldiers and families of the 1st Space Brigade. The 1st Space Brigade is the Army’s only space brigade. It’s made up of three battalions: the 53rd Signal Battalion (satellite control), the 1st Space Battalion, and the 117th Space Battalion Colorado Army National Guard. The 53rd Signal and 1st Space Battalions are charged with providing day-to-day Space support to the operational Army. It is a component of the U.S. Army Space and Missile Defense Command/Army Forces Strategic Command.